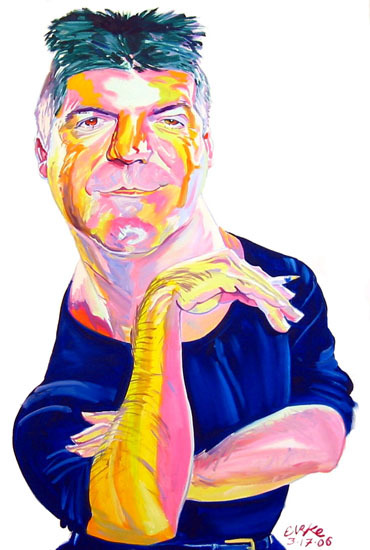 This Portrait painted by Philip Burke was first published in Rolling Stone Magazine in 2006. The Original Artwork being Oil On Canvas with approximate height 60in and width 48in. A REPRODUCTION I of the original painting, is printed on Canvas at approximately 100% of the original dimensions, with approximate height 60in and width 48in. A REPRODUCTION II of the original painting, is printed on Canvas at approximately 60% of the original dimensions, with approximate height 35in and width 28in. A REPRODUCTION III of the original painting, is printed on Canvas at approximately 40% of the original dimensions, with approximate height 25in and width 20in. A REPRODUCTION IV of the original painting, is printed on Art Paper at approximately 40% of the original dimensions, with approximate height 25in and width 20in. Reproduction art on Canvas (Reproduction I, II, III) is shipped stretched on a wood frame. Reproduction art on Art Paper (Reproduction IV) is shipped mounted, double matted (sliver and white), in a black frame, protected by a plexiglass screen. We offer a $120 discount if you prefer to have your reproduction artwork shipped Unmounted. Unmounted Artwork on Canvas (Reproduction I, II, III) is shipped rolled in a tube, and Unmounted Artwork on Art Paper (Reproduction IV) is shipped flat, unframed, and unmatted. If you wish to purchase Unmounted Artwork and obtain a $120 discount, please add your artwork to the cart and enter the coupon code UNMOUNTED in the coupon code input box during checkout. FREE Shipping includes delivery service to US domestic mainland locations only. For delivery to addresses in AK, HI, or International locations, please call us at 716.282.2933 or e-mail support@lbmason.com.